CLICK ON THE BLUE LINK ABOVE TO LISTEN TO THE SONG. For the first time ever on CD, CHRISTINE LAVIN's first album! With a career that takes CHRISTINE throughout the U.S. and Canada and points beyond and more than 20 albums, this is where it all started. This album is re-edited and re-mastered: one song, Prince Charles, has been deleted. BUT as a BONUS, two songs recorded at the live session that did not make the original vinyl pressing, If I Should Call You and I've Been Living On Milk & Cookies Since You've Been Gone, are included on this CD. CHRISTINE LAVIN has a great talent for expressing the lighter side of the darker side of life. She will make you laugh and her serious songs will bring a tear to most any eye. 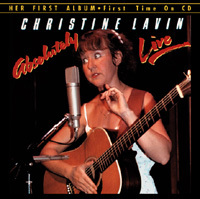 If you have never seen CHRISTINE LAVIN "ABSOLUTELY LIVE," do yourself a favor and listen to this CD. Recorded before a live audience in 1981 in CBS Recording Studio B, "Unplugged" before anyone invented the word! On June 29, 1981 CHRISTINE LAVIN emerged from the New York City songwriter scene with her first release, ABSOLUTELY LIVE, on Lifesong Records. CHRISTINE's songs deal with commitments, relationships and biological clocks. CHRISTINE has the ability to make us look at ourselves and smile and look at others with a smile. Since 1981, she has been recording regularly and touring extensively. When CHRISTINE is not performing or recording, she is busy drawing cartoon books, writing freelance articles or the occasional guest-host on New York FM radio shows.